Do you ever look 'round for something you can't find? Domino does! He looks 'round and 'round...and everything looks round to him, too! A game of fetch has never been this fun and colorful - so look 'round the inside of the book. You'll be surprised at what you find. You'll have a ball! The book comes with a CD featuring a reading of the book as well as a song inspired by the book. 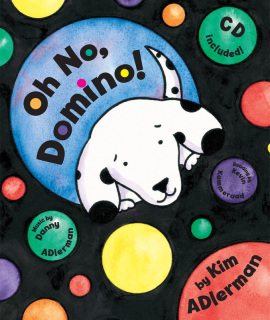 "Oh No, Domino! is a delightful children's picturebook with an accompanying audio CD featuring an audio performance of the story and a piece of whimsical music as a bonus. A little black-and-white spotted puppy named Domino looks round and round, trying to find thrown balls in a merry game of fetch, but so many other wonderful, colorful objects distract his attention! The simple outline-style drawings add a charming touch to this lighthearted story especially sure to appeal to young dog lovers." "...lovely repetitive text that tempts you to search the illustration for hints of what the curious dalmatian will do next. The book comes alive with bright illustrations of a landscape that seems to be transformed with each page into more and more circles…and dots…and anything round."